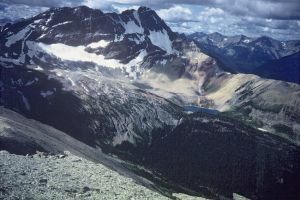 This peak is #91 in Prominence List for Alberta .Located S of White Man Pass and W of Mount Leval. Name Notes: Named in 1884 by George M. Dawson in 1884 after White Man Pass. The Pass takes its name from Pierre-Jean De Smet who built a cross and camped on the pass in 1845. The First Nations peoples called it White Man because John Palliser labelled it on his map.